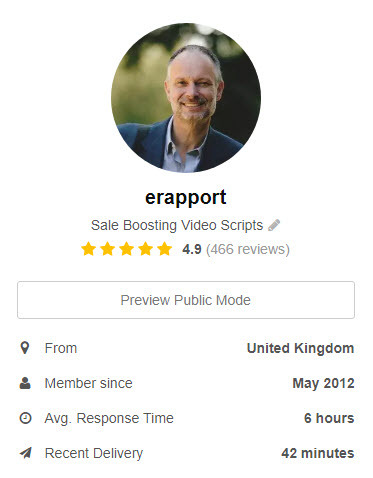 I will write your sales or promotional video script for you based on the information you supply. There is a proven formula that converts like Dam busters when it comes to video, and you can get it here for just $5. $5 gets you a script of 15 words only. 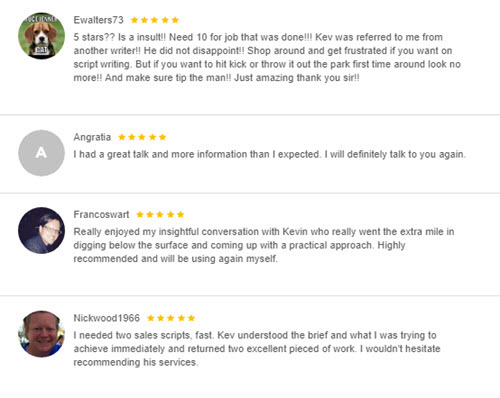 Whether you need a 1-minute script (140 words) or a long sales letter style video script (up to 1000 words) all are possible with this gig. See my gig extras for extra words/fees. Important: please contact me with your ideas/plan before buying my gig to save any confusion. I will assess your project and give you my honest feedback about how long it will take to get a powerful sales message across for your market. When you buy my gig, you are getting over 30 years of online and offline marketing experience. I am English speaking, run my own successful internet marketing business in the UK. Please take the time to plan what you want and need, and I will give you 100% of my experience and marketing skills to give your sales video the best chance ever of converting viewers into real customers. Not everyone is aware that YouTube ‘End Screens’ replaced the old ‘annotations’ back in Sept 2017. End screens enable you to seamlessly drive more traffic directly from your video screen via a series of buttons on the End Screen dashboard. These buttons will help your visitors navigate your YouTube channel by enabling you to suggest the next video to watch, to subscribe to your channel – and most importantly, click on a button to go directly to your website or landing page. Get 60% more clicks from visitors on both desktop and mobile (the old annotations did not support mobile) and increase your subscribers and channel video views by cleverly engaging your visitors using my 14 ‘Done for you MP4’ End Screen videos, complete with professional voice-overs – that you can download within this course. The process of setting up End Screens is covered in fine detail with ‘over my shoulder’ style videos and screen capture demonstration throughout. You also get 14x short Video MP4’s to add to all your videos to increase engagement. By the end of the course, you will have End Screens mastered to such a level that you’ll be able to optimize all your new videos on YouTube to maximize their click-through rate and access the hidden 60% of viewers who watch video via mobile. I’ve also included my own End Screen template in PNG format to help anyone who wants to get creative and produce their own End Screen videos in the future. As you’ll soon see, all the heavy lifting has been done for you within this course that is both relevant and timely in today’s growing Video marketplace. I’ve partnered with another Udemy instructor Alex Genadinik who has many additional courses on Udemy. Here is a page where you can browse some of his best courses and get discounts on his Udemy courses. If you are just starting an elearning business, Alex also offers the option to license online courses through his white label licensing. Here is an article where you can read about how to license online courses.